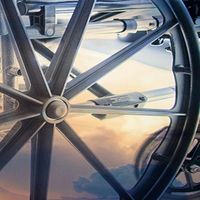 Act of Faith is a probative drama by Victoria playwright Janet Munsil and produced by niche theatre company Realwheels. The play is inspired by the true story of a Vancouver dancer struck down with paralysis in the lower limbs and remained wheelchair bound for thirteen years. Ultimately, she regained the ability to walk again, but naturally the incident created a backlash of skepticism and animosity. At the centre of Janet Munsil’s play, which has elements of a documentary, is the aptly named Faith (Danielle Klaudt), a capable woman in her twenties with a strong Christian belief. She lives in a newly opened facility for people with mobility issues with her room-mate and best friend Jess (Emily Grace Brook). Faith’s religious convictions don’t sit particularly well with Jess’ mother Gloria (Tanja Dixon-Warren), who suspects that she is disingenuous. Gloria’s hostility towards Faith intensifies when the younger woman is seen getting out of her wheelchair and struggling to walk on her own. Jess too is initially reluctant to share in Faith’s inexplicable improvement. Not having the same faith based beliefs as her friend, she refuses to associate it with divine intervention. Despite the best of intentions, the production falls a little short of its potential and indeed, the show’s early promise that began with eye-catching wheelchair choreography by Carolina Bergonzoni. Part of the problem is in the languid pacing that has the effect of stretching out the play. I get the sense that Act of Faith is actually a work in progress that will evolve beyond its present state. It would certainly be improved by being about fifteen minutes shorter. Another issue seems to be about the actor’s commitment to the dialogue. Only Emily Grace Brook and Mason Temple as the intellectually-challenged Damon offered any kind of conviction. David Roberts’ necessarily minimalist set is enhanced by Michael K. Hewitt’s aesthetic lighting. It provides as open a space as the stage will allow for multiple wheelchair activity. This Realwheels Theatre production did achieve one of its goals: providing a perspective into the special community of the disabled and how disabled people rise to their physical and emotional challenges.